Having recently reviewed a 2 CD set of Pietro Scarpini playing Mozart on the Rhine Classics' label, I'm please to have the opportunity to do the same for this more ambitious 6 CD set of the pianist's Busoni and Liszt recordings. 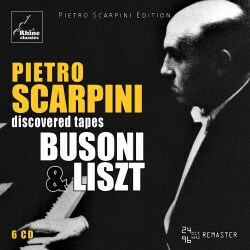 Once again the recordings derive from 'discovered tapes' and constitute another fascinating volume in their Pietro Scarpini Edition. Unusually, the pianist seemed to steer clear of commercial recordings, opting instead for home recordings of his concerts and radio broadcasts, which he meticulously catalogued. For those who know little about him, he was born in Rome April 6, 1911. He was fortunate having a mother who was a pianist, and she guided him through his first steps. He went on to study at the city's Accademia di Santa Cecilia, where his teachers were Alfredo Casella for piano, Ottorino Respighi for composition, Alessandro Bustini for conducting, and Fernando Germani for organ. A solo career beckoned, and he was lauded as “a new star in the international sky of pianists”. After the war, he developed an interest in contemporary music, with composers such as Hindemith, Dallapiccola and Schoenberg featuring prominently. Another was his fellow compatriot, the Italian composer, pianist and conductor Ferruccio Busoni, as this raft of recordings of music by him bears testimony. Scarpini retired from the concert platform in the late 1960s but continued to give master classes and teach in Siena and Darmstadt. After a series of health problems, he died in November 1997. A towering monolith aptly sums up Busoni’s Piano Concerto, whose gigantic proportions probably qualify it as the longest work in this genre. Totalling 70 minutes, structured in five movements, the last employs a male chorus, setting words from the final scene of Oehlenschläger's verse drama Aladdin. It makes for a challenging listen. Nevertheless, this recording from November 1966, where Scarpini is partnered by the Bayerischen Rundfunks under the direction of Rafael Kubelik, has garnered something of a reputation for distinction. Last year First Hand Records issued this performance, and it was enthusiastically reviewed by my colleague Stephen Barber. There it is marked as a live recording, Rhine Classics describe it as a studio recording set down over two days, 24 and 25 November 1966, and the original stereo master was used. I did detect what I thought was faint audience presence between movements. Scarpini surmounts the consummate technical challenges of the work with unruffled ease. What impresses me about this performance is the singularity of vision between pianist and conductor, a quality I also find in the Ogdon/Revenaugh recording on EMI. Kubelik shapes the orchestral side of things with a true understanding of the architecture of the work. The result is an overarching logic and inevitability which runs the course. It's as compelling a reading of this intriguing work as you're ever likely to find. The Piano Concerto accommodates the whole of CD 1. Discs 2-4 also contain music by Busoni, all for solo piano with the exception of two works for piano and orchestra. The Indian Fantasy is one of the composer's best known works. I was struck by the excellent sound quality of this 1968 live airing from the Théâtre des Champs Elysées, Paris with the Orchestre national de l’O.R.T.F. under Piero Bellugi. Composed in 1913-14 the Fantasy, in three movements, incorporates music and rhythms from various American Indian tribes. Scarpini’s high-powered technique and varied tonal palette does full justice to this melodically gifted score. The piano is favoured in the mix and, for me, it's one of the highlights of the set. The other work with orchestra is the Romanza e Scherzoso, Op.54, of 1921 with the Orchestra Sinfonica della RAI di Torino and none other than Claudio Abbado at the helm. It's not a well-known work, and I could find no other recordings of it, so it's a bit of a rarity in the Busoni oeuvre. Rhapsodic in parts, the later section conforms to a moto perpetuo. The solo piano works betray Scarpini's Busoni credentials - a remarkable technique, wide ranging sonorities and kaleidoscopic colour range, underpinned by a deep, probing intellect. He's also able to reveal to the listener the harmonic inventiveness of these challenging works. Nowhere is this more observable than in the Six Sonatinas (1910-20) of which, unfortunately, we are missing No. 1. The Sonatina No. 2 is an amazing piece, a sort of hybrid, fusing Lisztian bravura with atonality. What amazes me is that Scarpina's reading has an ineluctable inner logic. All the complexities are flawlessly delineated, aided by superb and sensitive pedalling. In No. 6 “Fantasia da Camera super Carmen”, Busoni’s imaginative flair with the Bizet excerpts is to the fore. Scarpini delights with a performance of rhythmic gusto and élan. We are treated to three of the composer's Seven Elegies (1907). I love these pieces for their adventurous harmonies and contrapuntal prowess. They're suffused with chromaticism and reveal themselves to be the product of a fertile musical mind. Scarpini's idiomatic performances get to the very heart of the music. There's a beguiling barcarolle lilt to Elegy No. 2 All’Italia! (In the Neapolitan mode). No. 6 Erscheinung (Notturno) has a probing introspection and air of mystery, very reminiscent of Liszt's late piece Nuages gris. Of the three Bach transcriptions, I would single out Scarpini’s rendition of the Fantasia in D minor, BWV 905 as a model of refinement. There are a number of versions of the Fantasia Contrappuntistica, Scarpini opts for the two-piano version and takes both parts, overdubbing them himself in his home studio in 1974. They sound excellent. The work is ambitious, and is the composer's tribute to J.S. Bach, inspired by The Art of Fugue. Scarpini contours the ebb and flow of this mighty edifice with adept skill and profound musical vision. He's particularly effective at building up the climaxes. He also plays both piano parts in the Improvisation on Bach’s Choral “Wie wohl ist mir”, which is a similar 1974 home confection. CDs 5 and 6 are devoted to Liszt. The works recorded here are, for the most part, late ones, dating from the last twenty years of the composer's life when his compositional style underwent a radical transformation. There's one work with orchestra, which Liszt penned in 1833. Taken from the same live concert as Busoni's Romanza e Scherzoso, Op.54, Scarpini's collaborators are the Orchestra Sinfonica della RAI di Torino and Claudio Abbado. A mosaic of changing moods, this is a reading of fire and potent intensity. Scarpini's late Liszt performances offer a wealth of insights. He instils a sense of foreboding in Nuages gris, Unstern! and La lugubre gondola II, whilst En rêve: Nocturne, in his hands, is not only evocative and dream-like but has a bittersweet quality. By contrast, the Ungarische Volkslieder (Nos. 1, 2, 4) offer some lighter relief. The ‘Pater Noster’ from the earlier 1847 cycle Harmonies poétiques et religieuses is reverential in tone. Ave Maria from 1862 has a lyrical charm, whilst the brief 33 second Album Leaf – Prelude funèbre has an enchanting innocence. There are many delights to be had in the selection of four Weihnachtsbaum S.186 (1, 3, 4 & 9), they truly evoke the spirit and atmosphere of the Christmas season. As an added bonus we have Scarpini's first known recording from 1938, a transcription by Busoni of Liszt’s “Grandes études de Paganini”, S.141: Etude No.2 in E-flat major, “Andantino capriccioso” . It's a perfect showcase for the pianist’s scintillating virtuosity. The source is a private 78rpm disc, which has been carefully restored. This set will appeal especially to aficionado’s of great pianism and will be of added value in enhancing Scarpini’s scant discography. The CDs are complemented with a beautifully illustrated booklet. Rhine Classics have carefully restored and remastered these valuable aural documents in 24bit 96KHz sound.